This book tells the story of the military life of the longest serving minister of defense of any country in recent times. 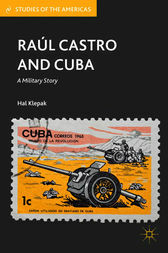 While the picture that often emerges of Raúl Castro is that of a colorless younger brother of Fidel—a product essentially of that grander figure—this book analyzes Raúl Castro as a man of his own, a politician and an impressive military commander and organizer, as well as a highly original thinker on both military matters and wider national issues that have faced the Cuban state over more than half a century. Filling a gap in recent scholarship, it demonstrates that the government he has put into place in Cuba in the last four years is very much his, and is not, as some believe, a mere shadow of his brother's. Hal Klepak is a professor of History and Warfare Studies at the Royal Military College of Canada. In addition to teaching, Klepak serves as special advisor to the Department of National Defense, the Department of Foreign Affairs, and the army commander for Latin American security affairs. He has authored numerous books and articles, including Cuba's Military 1990-2005: Revolutionary Soldiers during Counter-Revolutionary Times(2005).